* Biography of Harvey Milk, who was the first openly gay American to be elected to public office, in California. Why: One of those movies you can't stop thinking about. One of those films where you find yourself flabbergasted at that fact you had no idea this had all occurred. Harvey Milk should be known by everyone; WHAT A HERO. I don't think gay rights would be where it is today without this man. We still have a ways to go, but the movement for change really only began 40 yrs ago!!!!! That's really not that long ago. Especially considering how brutally gays were treated before this. The horrible acts almost brought you back to segregation, or even the witch hunts. 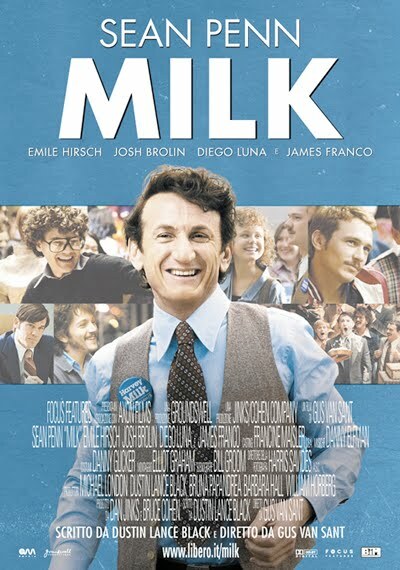 Despite all this, Harvey Milk was a loving man, and Sean Penn portrayed him as playful, happy, a strong man even in tragic times (and I mean tragic), one who saw the good in every individual. Milk seemed to have had an ancient, wise spirit, as if he'd studied with Buddha himself. Yet, he also interacted with a new age flair, as if he'd seen The Secret or was born as an Indigo Baby. He saw the innate goodness in all, and I think that's what was most inspiring about this flick.